The Nikkei reports that Mitsubishi Motors Corp. and South Korea-based LG Chem will jointly develop an advanced automotive lithium-ion battery system. 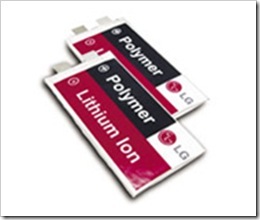 LG Chem will first supply lithium-ion batteries for electric prototype vehicles on which Mitsubishi Motors is working. The companies will develop a battery system that will add a power control device and a collision safety mechanism to LG’s batteries, and produce a prototype vehicle in which the developed battery system will be installed. They will also launch a pilot project for mass production at Mitsubishi Motors’ Nagoya factory. The two firms will conduct joint studies on the performance and safety of the new battery system in the hope of using it in some models. GS Yuasa Corporation, Mitsubishi Corporation (MC) and Mitsubishi Motors Corporation (MMC) launched a joint venture—Lithium Energy Japan—in 2007 to manufacture large-capacity and high-performance lithium-ion batteries for the i-MiEV. LG Chem, which mainly supplies batteries for cell phones and notebook computers, is supplying batteries to GM, Ford, Volvo and Hyundai in the automotive sector. The Nikkei report notes that this may become the first case of a Japanese automaker producing electric cars incorporating lithium-ion batteries made overseas. It's a time to make good collaborative steps to develop the new technology or innovative product to stay in main stream consumer market for LG it's will increase the presence in new car battery segment, for Mitsubishi it's an must to achieve work to be in business all the best for both of them.